Xming X Server for Windows - Trouble? Only use Xming option -ac or 'xhost +' on trusted networks, never on public ones i.e. be careful as they grant access to everyone. The X protocol network traffic is only encrypted if using X-Forwarding with SSH and this is therefore the recommended method for access control, all others method are potentially unsafe (e.g. using xhost or xauth and especially working via the defunct Telnet or Rsh/Rlogin protocols). Getting Xming-portablePuTTY (or standard PuTTY) working first, before using Plink, XLaunch or Xming, is always a good idea. I recommend using both PuTTYgen and Pageant in that process as well as setting up some PuTTY Saved Sessions. Warning: I recommend you do not alter DISPLAY on the remote terminal, when using X-Forwarding...you may end up with working, but unencrypted, connections to a server! Both XLaunch and Xmingrc make starting an X client via Xming's Plink easy. If a program displays from a PuTTY console but not from Plink then the default user PATH may need configuring/changing for the remote sshd server so that ssh can find it (e.g. either build '--with-default-path=etc:etc' or use environment files in '~/.ssh'). Remote X clients will not display, via PuTTY or Plink, without a correct localhost entry in /etc/hosts on the remote machine. Running xhost without any arguments shows the current hosts allowed to access the server. xhost can be used to give (or deny) systems access to the server interactively, overriding the contents of Xn.hosts files. An X server uses a host-based access control list for deciding whether or not to accept connections from clients on a particular machine. This list initially consists of the host on which the X server is running as well as any remote machines listed in the file Xn.hosts, where n is the display-number of the X server. Each line of the file should contain a [family:]hostname with no leading or trailing spaces and the file should reside in the Xming install directory. For Xming there are only three families: inet (for IPv4 and the default when no [family:] is mentioned), inet6 (for IPv6) or si (for Server Interpreted); note that there is no local family listening and [family:] is case insensitive. Copies of X0.hosts are usually needed (X1.hosts etc) to allow Plink/SSH local access to display-numbers other than 0. DISNO The display-number (an Xming specific convenience environment variable). DISPLAY The [Host IP address]:display-number[.screen]. The -display option can be used by most clients to override this variable. LANG Automatically set from the Windows locale, if not already set by the user, and then used to set the program locale. XERRORDB Defaults to the 'path-to-Xming.exe'\XErrorDB file. XHOSTPREFIX Defaults to the 'path-to-Xming.exe'\X and used as the file prefix for Xn.hosts files (an Xming specific convenience environment variable). XKEYSYMDB Defaults to the 'path-to-Xming.exe'\XKeysymDB file (the file is no longer required, but a custom one can still be used). XLOCALEDIR Defaults to the 'path-to-Xming.exe'\locale directory. Where 'path-to-Xming.exe' is the location of the Xming executable, typically C:\Program Files\Xming. If you run keychain for key management with SSH: you additionally get variables SSH_AUTH_SOCK and SSH_AGENT_PID. If the latter is detected by XLaunch (Run Remote/Use SSH), it runs without a Command Prompt console as an interactive password entry should not be needed. If you mix Cygwin and Xming variables, and/or have Cygwin directories in your %PATH%, you may get unpredictable behaviour. Xming installations can co-exist with Cygwin or MSYS, but I don't support Xming run from, or concurrent with, any Linux-like environments on Windows. The following files and locations are used by Xming, often in a way different from X on Linux/Unix. They are in the Xming install directory unless stated otherwise and, if customisable, are not deleted by the uninstaller. %LANG%\app-defaults The directory for X client resource files. These can be language specific i.e. directory %LANG%\app-defaults is searched before app-defaults. bitmaps The directory for standard bitmap files. font-dirs A file containing a comma-separated list of directories to add to the default font path. fonts The directory containing Xming-fonts (if installed). locale The directory for locale files. This is the latest list of locales. protocol.txt The registry of protocol names used by the X server. twmrc Tom's [sic] window manager control file, renamed from .twmrc. Xn.hosts The initial access control list for display-number n.
Xauthority The .Xauthority file renamed and in the %HOME% directory. Empty lock files Xauthority-c and Xauthority-l are used in %HOME%, but these should not persist. Xcms.txt The sample colour name database file. Xdefaults-<hostname> The .Xdefaults file renamed and in the %HOME% directory. These files resources are loaded before app-defaults. Xdefaults can be relocated using the XENVIRONMENT variable e.g. 'set XENVIRONMENT=C:\test\Xdefaults' or just 'set XENVIRONMENT=Xdefaults' (the latter is useful if running Xming portable, when Xdefaults can be moved onto the portable device). XErrorDB The X error message database file. xkb The directory for xkb database files. This is the latest list of keyboard models, layouts and variants. XLaunch.xsd The XLaunch XML Schema Definition file. Xmingrc The Xming server resource configuration file(s). Note: font-dirs contents are matched to the actual paths found during installation (using font-dirs.exe); if an existing file does not exist. Note: that an Xming-portablePuTTY installation has its own separate putty.conf. # follow.exe and xhost.bat are in "Tools and clients"
&Usage execd "Xming :999 -help"
"Access Control &Status" execd "xhost.bat"
Debug "Using the default Xmingrc configuration file." twmrc is supplied containing jim.twrc from X.Org's twm source code. fonts.scale Windows System fonts directory (i.e. %WINDIR%\Fonts). xkb_a00560 server-0.xkm %TMP% or %TEMP% or %USERPROFILE% or 'The Windows Directory'. First path found is used. Xming.n.log %TMP% or %TEMP% or %USERPROFILE% or 'The Windows Directory'. First path found is used. Xmingrc %HOME% (per-user) as well as one in the Xming install directory (system-wide). on the remote machine (untested solution for rendering some Java components on JDK 6 and earlier...widely found on the internet). Xming keyboard data originates from the X Keyboard Configuration Database Project. The current list of keyboard models, layouts and variants is here. so that the entry can be added to the known keyboard layouts. I use -xkbvariant extd to get United Kingdom extended keys to work with a -xkblayout gb Microsoft keyboard. Some Unix flavours cannot have NumLock enabled when running Xming. Disable NumLock with remote AIX, SUN Solaris and HPUX, if keys or mouse buttons are not working, using numlockoff. The numlockoff 32-bit & 64-bit zip files contains the code and executables to check the state of the NumLock key and synthesize a keydown/keyup sequence of the NumLock key if it's down. AIX logs in using /usr/dt/config/Xsetup (used only if using dtlogin as the XDMCP client) and /usr/dt/bin/Xsession (used when logging in to CDE). These contain a call to xmodmap (for IBM keyboards) which makes the Xming keyboard go wrong. Commenting out these two calls allows you to use Xming on AIX. Note that the XKB extension is now always enabled in the X.Org X server and that the AIX X server has the XKB extension, but it is disabled by default in favour of xmodmap methods. If you use the Logitech Mouse Drivers: uncheck the option 'Disable Acceleration In Games' or your mouse will be slow in Xming. Logitech web-cam drivers can also cause 'Can't open display' problems. Zone Alarm can cause Xming to freeze right after startup. Following on from the original patch for multiple monitors it appears that FullScreen DirectDraw4 can only draw on the 'Windows Primary Display' irrespective of the use of SM_CXVIRTUALSCREEN etc in the code. winInitMultiWindowXMsgProc - setjmp returned: X. Exiting. winInitMultiWindowXMsgProc - Caught IO Error. Exiting. winInitMultiWindowWM - setjmp returned: X. Exiting. winInitMultiWindowWM - Caught IO Error. Exiting. any of these indicate failure of the X protocol. Maybe due to the presence of firewalls, or high network latency. The clipboard may also be failing with a buggy remote DM in XDMCP mode (you could try another DM or run without -clipboard) or, for the first two, the clipboard thread may just be about to restart. Ignore these reports during shutdown. Most tools, except the XDMCP interface matcher in DefineSelf(), should work with both protocols. SSH compression may be of some help on slower networks, but will slow things down on fast networks. The encoding of network traffic used by the X protocol is optimised for LANs, where the time spent encoding and decoding the data is more important than minimizing the amount of data transmitted. While this is fine for an Ethernet, it becomes a problem for very slow networks like serial lines. X.Org have abandoned LBX, their own built-in compression system, in favour of using SSH compression on slow networks. Operation via a personal firewall, VPN or any software that modifies the TCP/IP stack, will increase latency and make the X server appear unresponsive. Especially Webwasher, Symantec Antivirus and Zone Alarm. Disabling these products isn't sufficient, uninstall them to restore network performance with the X protocol. Some badly designed virus scanners aggressively interfere with all network traffic and can cause a serious processing overhead for X. Also check you are not using any of these Intrusive Applications e.g. 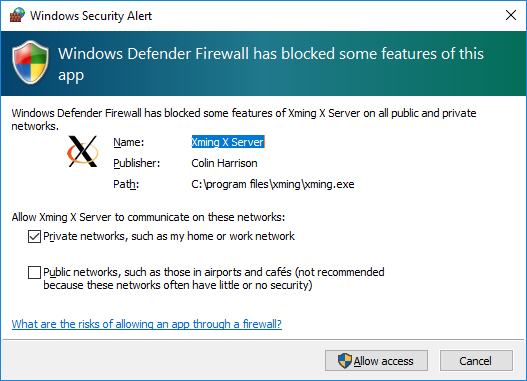 I turn off the Windows Defender service while running Xming. You can use tool autorunsc -mn to list third-party LSPs inserted in your TCP/IP protocol stack. Nagle's algorithm is detrimental to X protocol transmission over a network and can cause a performance penalty for some applications. GLWIN_DUMP_PFD=1 Output information on the requested visual and pixelformat. GLWIN_DUMP_HWND=1 Output the window handles used in some operations. GLWIN_DUMP_DC=1 Output the device context handle used in some operations. GLWIN_ENABLE_GLCALL_TRACE=1 Output GL function call trace. GLWIN_ENABLE_WGLCALL_TRACE=1 Output WGL function call trace. GLWIN_DEBUG_ALL=1 Enable all of the above. mentions your Windows machine's graphics card vendor, if it mentions Mesa, you still have software rendering. Accelerated indirect GL does not occur with local clients. Note: Xming releases (7.5 series), used without option -wgl (i.e. just with software rasterization), render with the Mesa library (latest version: OpenGL 2.1, GLX 1.4, Mesa 19.1.0-devel) and usually display even the most difficult clients. If you insist on running the whole of KDE or Gnome in -multiwindow or -fullscreen mode: don't expect blistering performance. Use coLinux or XDMCP mode if you want a full Linux/Unix graphical environment on the Windows desktop. Some people find running Xming with +bs -wm (the backing store) improves the performance of image updates e.g. with CAD applications via XDMCP. before starting the client application. There's a performance trade-off between rendering performance and network latency, so you should try both direct and indirect rendering and see which performs best in your specific circumstances. Generally, accelerated indirect rendering should be more performant for clients that render complex scenes. Xming installs on Windows 10/8/7/Vista/XP (+ Server 2012/2008/2003). Windows versions prior to XP are not supported. However I no longer test Xming installed on XP/Server 2003: so fault-finding can be problematic. Xming and Xming-portablePuTTY, compiled 32-bit, run on 32-bit Windows and via WoW64 on 64-bit Windows (x64 and ia64). Native 64-bit (x64) versions are also available and are preferred on 64-bit Windows (x64). Xming doesn't support the MIT-SHM, XFree86-Bigfont or XVideo extensions. MIT-SHM only applies when the client and xserver are on the same machine: adding it would not improve network performance i.e. Xming is primarily designed to operate with clients over a network. Xming also does not yet have a working -pseudocolor mode, for 8-bit colour use -fullscreen -depth 8 in one window mode which enables DirectDraw4 (-engine 4). Xming just uses the Windows MessageBeep(MB_OK) function for the bell: so no fine control of volume, pitch and duration is possible. However the bell (beep) can be switched off with X server option -f 0, or when the server is running, with various 'xset b' options. First read the notes in XLaunch for XDMCP remote settings. Use option -wgl, in XDMCP mode (e.g. -query), if your Windows machine's graphics card supports OpenGL. If you have a multiple interfaced (i.e. multihomed) Windows machine: you may need to use the -from option to set the correct source address (in IP address dotted format). This should not be necessary in recent versions. If you have a Windows machine with multiple interfaces on the same network as the remote host (e.g. have bonkers virtual IP addresses ): the xserver may bind to the wrong network adapter. This can be fixed by altering 'Interface metric:' numbers to give the correct adapter priority (see use a different default network card). I tested this by adding 'virtual' Microsoft Loopback Adapters, with IP addresses on the same network as a 'real' network adapter, and then playing with interface metric numbers. Note: this multihomed Windows fix may be needed in other Xming modes, not just XDMCP. but don't expect Xnest to be as fast as a direct XDMCP session. and then restart gdm. Also some X Display Managers do not work well anyway with the Xming clipboard. So just try using standard xdm as an alternative . and remember to change Xaccess and kdmrc as described elsewhere. A hostname chosen using the host finder or XPing has to still resolve (to an IPv4 address) with DNS or hosts (e.g. have an entry in C:\Windows\System32\drivers\etc\hosts) for XDMCP to work with it. If you get 100% CPU use with Xming.exe: the chances are that the XDMCP protocol cannot establish a socket connection with the remote machine.